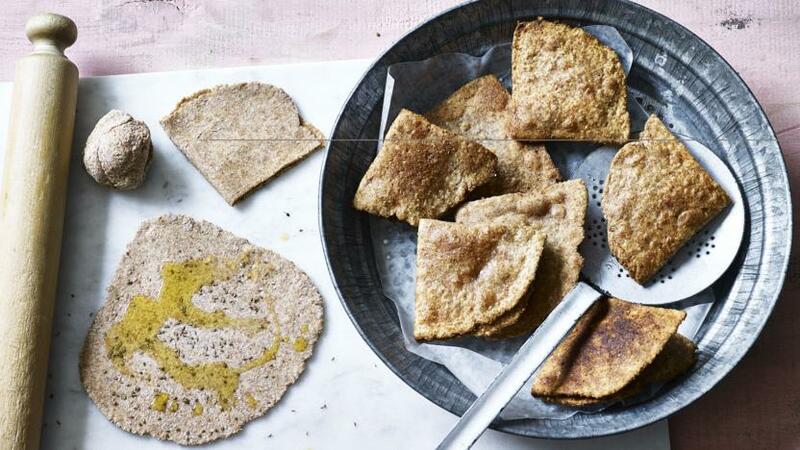 These fried wholemeal parathas are very crispy making them perfect for dipping into Indian chutneys. Place the flour in a large bowl and make a well in the centre. Add the salt and one teaspoon of the oil to the well, then gradually add 150ml/5fl oz warm water. Stir until the mixture forms a soft dough. If the dough is dry and does not come together, add an extra 1-2 tablespoons of water. Knead the dough by clenching your hand into a fist, then wet your knuckles and press them repeatedly into the dough, pressing against the side of the bowl, until a soft, smooth dough forms. This should take about 10 minutes. Divide the dough into six balls of equal size. Dust each ball with a little flour to prevent it sticking, then roll out on a lightly floured surface into 15cm/6in circles. Sprinkle ¼ teaspoon of ajwain seeds over the circles and press the seeds into each paratha. Smear one teaspoon of olive oil over each paratha. With a sharp knife, slit the paratha to make two semi-circles and fold, then fold again to make a quarter circle (or triangle). Flatten the triangle with your fingers and roll it out again. Use circular motions to do this to try to keep to the shape. While rolling do not press down too hard as this will cause the layers to stick together and the paratha will not be flaky. About 5mm/¼in in thickness is good. Heat a shallow frying pan over a medium heat until a splash of water sizzles on the surface. Place a paratha in the pan and cook for 20 seconds, or until the top starts to brown and slightly bubble. Turn the paratha over using a spatula and continue cooking for about 30 seconds, or until brown spots appear. Flip it over one more time and, using the spatula, carefully press down all over. Turn over again and repeat on the other side until you have the desired crispiness. Keep each paratha warm, while you repeat to cook them all. Serve hot. Ajwain seeds – also known as carom or lovage seeds – give a flavour similar to thyme.